Three generations of our family have relied on FAJ for more than 40 years to take care of our financial affairs. Through that period the team at FAJ have proven themselves to be of high quality, knowledgeable, accessible and responsive to our family business accounting, tax and structuring needs. More importantly though, Mike McGrath has become more than just our Accountant. He has worked with our family personally for 20 years and through that period has become a trusted and respected advisor. Mike has been there in our most complex times, assisting my parents with their financial affairs during retirement, helping to set up my own business with an appropriate structure, and in particular helping administer the wills and estates of my parents. As a consultant who works with families and small businesses at times, I sometimes have the opportunity to compare the skills and services of external accountants and accounting firms and I can say that Mike’s attention to detail and care for his clients is second to none. My accountant Adrian has helped me through a lot of ups and downs that my business goes through. 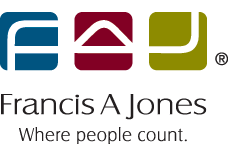 He knows my business so well that I think of Francis A Jones as a business partner, and not just my accountants. I often need to run ideas past him or for some technical advice which he is more than happy to answer for me. If he is not available there is always someone else at FAJ that helps out. They offer a great level of service and I cannot thank them enough for the professional manner in which they help me to deal with company decisions. FAJ have been our external accountants since the company was established in 1992. Over the years they have provided us with a range of accountancy services in a professional and friendly manner, which together with their attention to detail has created the strong relationship that we enjoy today. I have worked closely with FAJ for more than 10 years. They have worked closely with me to understand my business and have continued to look for ways to make the management of my tax and accounting as efficient as possible. We run a chain of medical clinics. Several years ago we asked Ben Paganoni of Francis A Jones to look after the accounts for our Perth based business. Within two years he was looking after all of our national business from his base in Perth. He has successfully helped us navigate a complicated partial buyout and his advice was well researched and helped us maximise our position during these negotiations. We have found Ben and FAJ to be more than an accountancy practice. They have become a true business partner in every sense of the word. Their advice has helped us grow our business quickly whilst avoiding many of the pitfalls along the way. We would highly recommend both Ben Paganoni and FAJ.